While road-tripping down I-65 to our family’s vacation destination in Destin, Florida a couple weekends ago, we decided to stop for a look at the former home of Dr. Martin Luther King, Jr. in Montgomery, Alabama. Little did I know that it was going to be such an inspiring look into the life of a leader that has always been one of my personal heroes. We found the city of Montgomery to be a very quiet place on a Saturday afternoon and were able to locate the Dexter Avenue Baptist Church parsonage where Martin Luther King used to live fairly easily. Tucked away on a neighborhood street, surrounded by houses of like shape and size, was the humble house once inhabited by one of the most influential men in recent history. What struck me first was the realization that this was really where it all started and shifted. This seemingly insignificant-to-the-naked-eye home was where the seeds of revolution were planted and grew. What an awesome feeling to stand where he stood, walk where he walked, and look upon some of the same scenery that he would have looked upon. It was truly exciting! #1 – Leaders never lose their composure even when they’re under attack. As we walked up to the house, our tour guide stopped us on the steps to show us the site on the porch where the Kings’ house was bombed on January 30, 1956, because of his involvement in the Montgomery Bus Boycott of 1955. 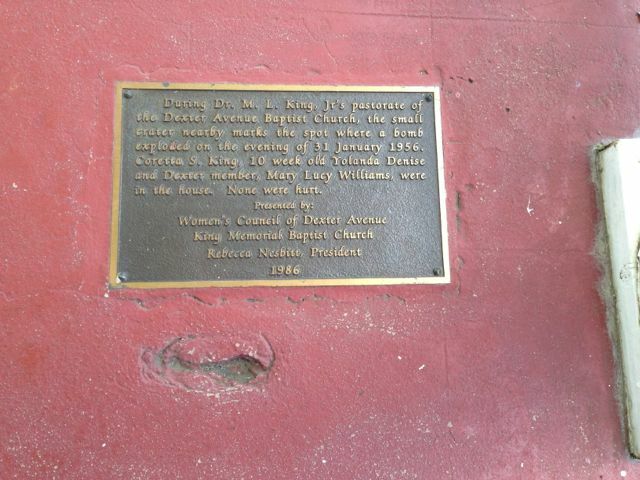 Dr. King was away from the house, at an evening meeting with bus boycott members, when the bomb exploded on the front porch of his residence. It was an especially scary moment for his wife, Coretta, and their newborn daughter, Yolanda who were both home at the time of the explosion but were thankfully unharmed. 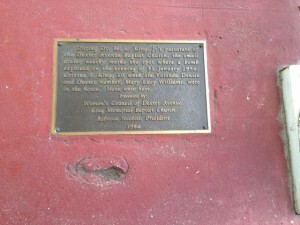 The house bomb left a mark on the porch of the King’s home that is still there today. Dr. King knew that he must retain his peace in the midst the chaos so that he could help bring order to it. As leaders, we should always be the masters of our own emotions even when we don’t feel like it. #2 – Anyone can raise a higher standard some of the time, but great leaders are those that live those high standards all of the time. As we moved in from the front porch and stood in the living room area of the home, we began to hear stories from our guide of how Martin Luther (as he was referred to by his close friends) was a reluctant revolutionary and instead just wanted to lead a life worthy of God’s call on his life. Not interested in what others were doing, he only cared about living his life in accordance with what he understood to be the standard that Jesus set for his followers as recorded in the Gospels. The birth of the Civil Rights Movement that Dr. King is credited with leading began when Rosa Parks refused to give up her seat on a Montgomery bus and was arrested. Her simple act of disobedience to an unjust law raised the standard for the Black community and catalyzed the bus boycott that was planned by leaders of the Birmingham African-American community and led by Martin Luther King. Steeped in the philosophy of non-violence, Dr. King lived that standard every single day in his private and public life. He always met those that threatened his life with a kindness they didn’t deserve and was a father who never saw the need to spank his children. His life was lived as an example for those that followed. Dr. King knew as we all do, that character commands influence. Who a person is when no one is looking is who they really are. While Rosa Parks was able to elevate the expectations of her community with a single act, the Civil Rights Movement had to be led by a person who was willing to act with integrity day in and day out for the duration of the campaign. 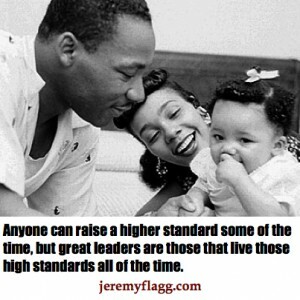 Dr. King had high standards for himself that he lived in both private and public. Revolutions may begin when someone raises the standard but can only be sustained when the leader lives the standard. Question: What are some of the best leadership lessons you’ve learned and where did they come from? You can leave a comment by clicking here. In part 2, we’ll cover lessons 3-5 and talk about how great leaders must be decisive, responsible, and selfless. Sounds like an incredible experience and an opportunity to better understand an incredible man and leader. So inspiring. I love the challenege people like Dr. King present, to raise the bar. To create change in a revolutionary way. Great food for thought this morning.